The son of a member of the US military, Jermaine Jones spent his early years in the United States before returning to Germany with his mother. This allowed Jermaine to play for either the USMNT or Germany. He chose Germany, appearing for their youth teams. With Jones not getting capped at senior National Team level, a FIFA rule change allowed him to switch to the United States in 2009. A broken leg took him out of contention for the 2010 World Cup squad, and Jones received his first cap against Poland on October 9th, 2010 in Chicago. At club level, Jones is an established talent in Germany's Bundesliga, playing first for Eintracht Frankfurt before moving to Bayer Leverkusen, back to Frankfurt, and ultimately signing with Schalke 04 for the 2007-08 season. Jones left Schalke during the 2014 January transfer window, signing with Besiktas in Turkey's Super Lig. Jones saw out his contract with Besiktas, joining the New England Revolution in August, 2014. The day before the start of the 2016 MLS season, Jones signed with the Colorado Rapids. He joined the LA Galaxy for 2017, leaving at the end of the season. Jones officially retired in September, 2018. 2017: Started against Serbia on Jan 27. Started against Panama in the WCQ on Mar 28. 2016: Started against Iceland on Jan 31 and Canada on Feb 5. Started against Ecuador on May 25 and against Bolivia on May 28. Started in the Copa Centenario opener against Colombia on Jun 4. Started against Costa Rica on Jun 7 and scored. Started against Paraguay on Jun 11. Started against Ecuador in the Copa Centenario quarterfinals on Jun 16. Started against Colombia in the 3rd-place game on Jun 25. Started against Mexico on Nov 11 and against Costa Rica on Nov 15. 2015: Started against Chile on Jan 28 and Panama on Feb 8. Started the Sep 5 friendly against Peru and the Sep 8 friendly against Brazil. Started the Confederations Cup playoff against Mexico on Oct 10. Started against Costa Rica on Oct 13. Started the World Cup qualifier against St Vincent and the Grenadines on Nov 13 and against Trinidad & Tobago on Nov 18. 2014: Started against Ukraine on Mar 5. Named to the final World Cup roster. Started against Azerbaijan on May 28th, Turkey on June 1st, and Nigeria on June 8th. Started against Ghana in the World Cup Group G opener on June 16th. Started against Portugal in the World Cup on June 22nd and scored. Started against Germany in the World Cup on June 26th. Started against Belgium in the Round of 16 on July 1st. Started the Oct 14 friendly against Honduras and against Colombia on Nov 14. 2013: Started against Honduras on Feb 6th, Costa Rica on Mar 22nd, and Germany on Jun 2nd. Started against Jamaica in the Jun 7 World Cup Qualifier and against Honduras on Jun 18. Started in the friendly against Bosnia and Herzegovina on Aug 14th. Started against Costa Rica on Sep 6 and Mexico on Sep 10. Started against Jamaica on October 11. Started against Scotland on Nov 15 and Austria on Nov 19. 2012: Called into January camp, captaining the USA against Venezuela on January 21st and assisting on the game winner. Once again captained the USA against Panama on Jan 25th. Scored against Scotland on May 26th. Started against Mexico on Aug 15th. Started against Jamaica on Sept 7th and 11th. Subbed on in the second-half against Antigua & Barbuda on Oct 12. 2011: Started against Argentina on March 26th and was a second-half sub against Paraguay three days later. 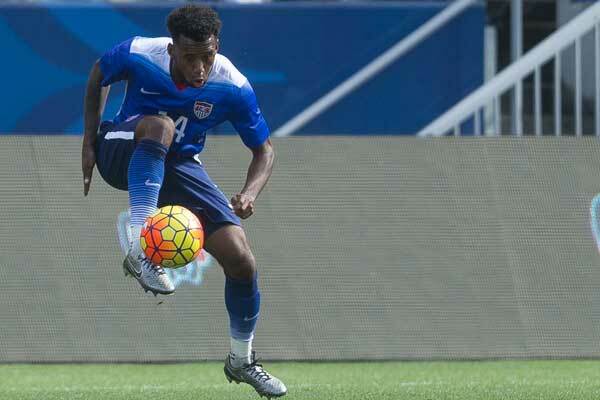 Scored his first goal for the US in the 2-0 win over Panama in the Gold Cup quarterfinals. Started in the Gold Cup final against Mexico on June 25th. 2010: Called into the Brazil camp in Aust, but unable to participate due to injury. Made his debut against Poland on October 9th. 2009: Switches national team eligibility to the United States. 2017: Signed with the Galaxy as an MLS free agent in January. Left the team at the end of the season. 2016: Part of the turnaround in Colorado, advancing to the playoffs. Left the club at the end of the season. 2015: Made the playoffs with New England, letting his contract lapse at the end of the season. 2013-14: Played the first-half of the season with Schalke but left the club in January for Besiktas. Finished 3rd with Besiktas in the Turkish Super Lig. Joined the New England Revolution in August. 2012-13: Finished 4th in the Bundesliga with Schalke 04 and made the Round of 16 in the Champions League. 2011-12: Qualified for the Champions League with a 3rd-place finish with Schalke 04. 2010-11: Joined Blackburn Rovers in the Premier League on loan from Schalke for the second half of the season. 2009-10: Missed the entire season with a broken leg. 2007: Transferred to Schalke 04 where he was a regular starter. 2005: Returned to Eintracht Frankfurt. A leg injury kept him out of action for eight months. After regaining fitness, he was eventually named captain of Eintracht Frankfurt. 2004: Joined Bayer Leverkusen where he eventually broke into the senior squad. 2001-02: Became a regular starter with Eintracht Frankfurt's senior squad. 2000: After spending five years in the Eintracht Frankfurt youth program, Jones emerged as a regular with Eintracht's reserve team.